The march of progress means that not all things from the past are relevant now, but it also means that some things shouldn't be tampered with. Take for instance the strange (by today's standards) baroque powdered wigs that people used to wear, you wouldn't go to the barbers to get one fitted now. They were mainly used to cover baldness due to head lice, not such a problem in the 21st century. But, some things do remain constant and by some things that means: beer. Yes, the beloved alcoholic drink that comes after only tea, coffee and water as Homer Simpson's and the world's most favored beverage. So once you hit upon a good recipe you don't want to mess with it, you just want to consume it - 'Mmmmmm...BEER'. And that holds for Bavaria beer, a prestige beer that with a great heritage that has remained in independent ownership since the early 1700s. It's one thing from that period in history that certainly doesn't need to change. 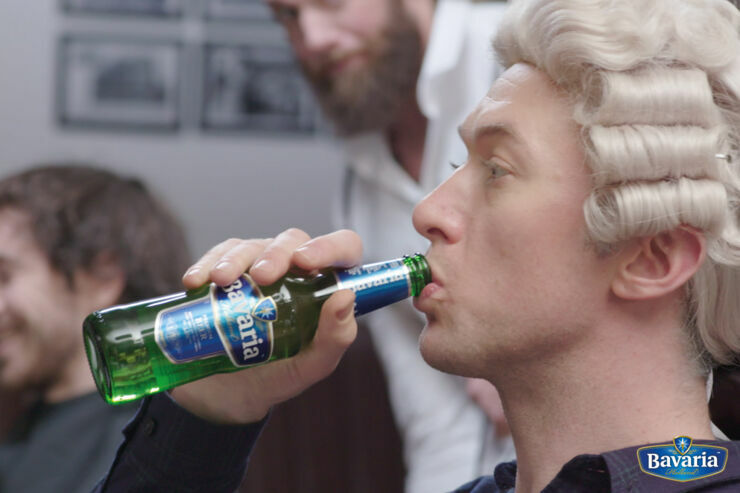 The Swinkels family have been brewing Bavaria beer in the small Dutch village of Lieshout, just outside of Eindhoven since 1719. The brewery, run by the seventh generation of Swinkels, stands on the location of the farmhouse where the first generation started brewing almost three hundred years ago. The company is still 100% family owned. And the beer 100% crisp and enjoyable. That doesn't mean you have to don a lice-ridden wig to enjoy it, it just means it has stayed true to its origins for three centuries. And always remember people, beer is good for you. Bold fashion was also all the rage back in the 1700s too, but as this woman shows it doesn't make for the greatest fashion item to be wearing to a modern day 21st century bar. Equally the 21st century isn't particularly suited to the 18th century, although this old portrait in shades and headphones does have a certain something. I guess you could call it Retro Renaissance.